Gardnerian Wicca is so named after its founder, Gerald Gardner. Gerald Gardner lived from 1884-1964 and was part of the New Forest Coven, which met in the New Forest area of England from the 1930’s to 1940’s. Gardner claims to have learned many of the beliefs and Wicca practices that he carried forward to his own tradition from this order. He then founded a new coven, which he called the Bricket Wood Coven, which practiced in the town bearing the same name. Several members of this tradition were to go on to become prominent figures in the growing religion of Wicca. Among them are Robert Cochrane, who went on to form Cochranian Witchcraft, and Doreen Valiente, known for her authorship of The Witches Rune and the Charge of the Goddess. Gardnerian Witches organize into covens of up to 13 members, though it is not unknown for them to occasionally go beyond this number. These Covens are headed by a High Priest and High Priestess, who preside over the order and head the magical rituals they practice. Among these are the initiation rites, and the granting of Degrees within the Coven. There are three degrees within this Wicca Coven structure, and each permits initiation into further mysteries that are only revealed to those who have risen to such a degree within the Coven. Gardnerian Wicca recognizes two primary deities, known as ‘The Lord and Lady’ or ‘The Horned God’ and ‘Mother Goddess’. The Mother Goddess is often referred to as Aradia, an Italian Goddess, and the Celtic God of the wild known as Cernunnos. Gardnerian Wicca uses a number of tools not normally found outside of British Traditional Wicca. The more common Wand, Chalice, Pentacle, and Boline are used, but others are included not commonly found elsewhere. The Sword takes the place of the more common Athame, and the Scourge finds it’s way into initiation rites, representing the willingness of the initiate to suffer and sacrifice for knowledge. Also to be found was the Cingulum, a ritual cord or belt that was worn about the waist. These were conferred upon a practicioner at each crossing of a degree, and was worn at all rituals thereafter. They are nine feet long, calling on the sacredness of three times three, and are also used to measure the circumference of the circle to ensure it was cast correctly. Gardnerian Witchcraft was the father tradition of many others that were to follow. Others branched off, including Alexandrian Wicca and Cochranian Wicca, drawing on the teachings of Gardner, and moving forward to create their own paths. This is an important aspect of Wicca to this day. With Wicca being such a personal religion, it is permitted and encouraged to alter the meat of the faith, while adhering to certain basic tenets. 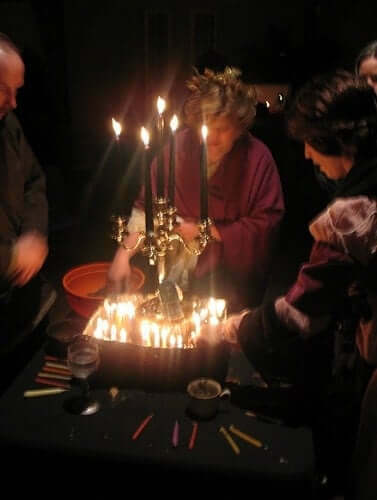 There are still covens today that practice ‘traditional’ Gardnerian Wicca, and its ways have touched almost every tradition that has come since.